I’m another roommate of the critically acclaimed Rachel and Tara. And I’ll be honest. Before I moved into our group house, I didn’t know that people like the Mislabeled writers still actually existed. At least not under the age of 50. I mean, don’t get me wrong – I think women should have the same rights as men and all that stuff, but really? You’re a feminist? Come on, that’s so 1960’s. Last time I checked I could vote, own property, and earn more than my boyfriend. So excuse my ignorance. So why is it that I still can never see myself embracing, personally claiming, the feminist title? The truth is, you all are mislabeled. Feminism carries a stigma, and I think it’s time for a brand refresh. Third-wave, schmird-wave; I’m talking something completely new and different here. Let’s start by getting that pesky “fem” prefix out of there; we’re alienating those critical, and I mean critical, male allies! Next, focus in on the real goal: equality of both genders. No one superior, no one inferior, just different human beings living and working together. And what do you get? Gendequalism! Now, try that one on for size! Kind of a mouth full I’ll admit, but it’s really only four letters longer than feminism, and I have a feeling this is really going to catch on. So spread the word! You make the buttons, and I’ll make the t-shirts – in men’s and women’s sizes for once. This post is brought to you by Kelsey. Follow her on Twitter — @kelcoh. One of my favorite things about living in a group house is the listserv we share, and the subsequent debates with which we entertain ourselves. 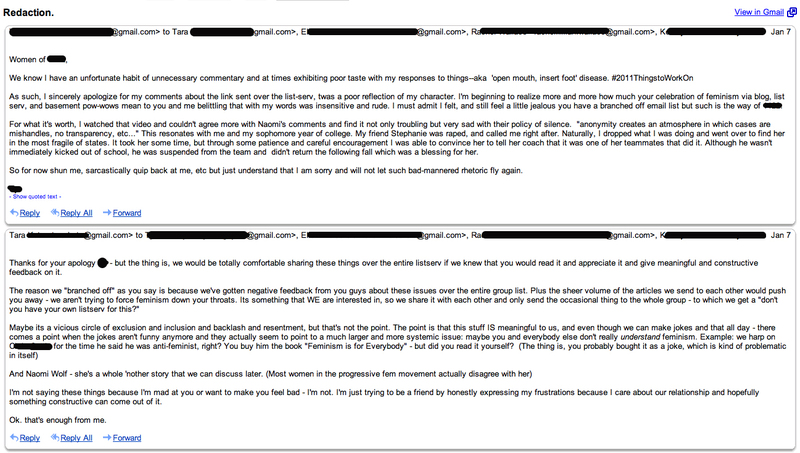 Recently, one of my roommates emailed a link to Naomi Wolf’s ridiculous remarks on the Assange situation, despite the existence of a separate feminist listserv for the ladies of the house. One of the guys said something sharp about having our own listserv for these kinds of things. To his credit, he apologized, as you can see below. But I think his apology, while full of good intentions, just goes to show how mislabeled and misunderstood feminism remains. So I wanted to share this conversation with you all. This post is brought to you in a somewhat anonymous fashion by Tara.